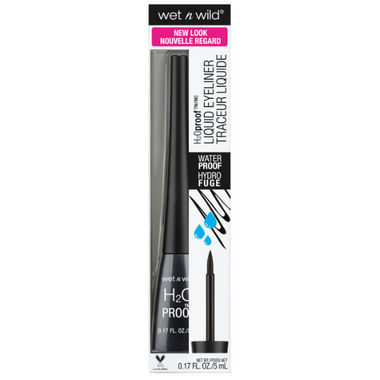 Wet n Wild H2O Proof Liquid Eyeliner provides lasting Waterproof Definition that won't let you down! It's waterproof, smudgeproof, and super long-lasting. Create subtle fine lines to bold dramatic looks with the precise applicator brush. Directions: Start at the inner corners of your eyes and make small strokes following the shape of your eye. For extra drama, extend and thicken at the outer corner of your eyes. Ingredients: Isododecane, Trimethylsiloxysilicate, Trimethylpentanediol/Adipic Acid/Glycerin Crosspolymer , C11-12 Isoparaffin, Polypropylsilsesquioxane, C8-9 Isoparaffin, Trihydroxystearin, Silica Dimethyl Silylate, Phenoxyethanol, Sorbic Acid, Tocopherol, Black 2/CI 77266. It's very black which I liked, but it took a long time to dry, and smudged even after it had dried. Easy to remove at least.